Solid cedar top; rosewood back/sides. Wow! Suzuki Guitar Repair and Modification Info..
"I have a Suzuki Guitar, but it doesn't sound as good as I had hoped for..."
Not every Suzuki guitar is equal to an "inheritance" guitar. Some may just require a setup to sound better; others may be too heavily built or have intonation problems (personal experience with some steel strings built by Kiso...see the W300D video. The frets are a bit off compared to a Martin fretboard, same scale length). BUT, it's possible to fix some of these problems and have your guitar sound a lot better. Also, different years, different labels (jobbers? ), and whether the guitar was intended for export or for Japan - seems to have made a difference. "If you have read my site in any depth you will know that I am not one for simple answers, and there is no exception here. There are a number of variables here which should be considered. What exactly is meant by the term laminated top? Does it mean conventional wood laminates with the grain orientation of the middle ply at 90 deg. to the outside plys? Could it mean a wood laminate where grain orientation was aligned for all plys? Could it include a center ply that is not wood at all, as in so called double top construction? And then there is the issue of what the term "sound as good" means and implies. What sounds good to folks most often is what sounds most familiar. And it is certainly true that the musical material played on any type of instrument evolved along with the instrument, and exploits the features and works around the shortcomings of that type. These two factors conspire to make instruments with construction that deviates significantly from the norm for the type to be perceived as sounding not as good sometimes. My general observation of sonic differences between instruments with solid wood tops and wood laminated tops with center ply at 90 deg. is that the laminated top instruments offer less overall sustain. In musical styles and applications where sustain is considered to be a good thing, then laminated top instruments are generally perceived as tonally inferior. Painting with a broad brush, this means classical and steel string acoustic guitars. Less sustain generally provides more perceived separation of notes of chords and in applications where this is a desirable feature, such as in archtop jazz guitars and other applications where complex chords are a key tonal element, laminated top instruments are more well received. It is my observation that, if one judges acoustic bass guitars by how close they sound to pizz upright bass, that reduced sustain helps to move the tone in that direction. That said, I have heard nice sounding ABGs with laminated tops. Let me briefly touch on less conventional types of laminated tops. In my observation the so called double top classical guitars (which make use of spruce laminated with a central core of honeycomb Kevlar) sound no worse but certainly no better as a class than instruments using solid wood tops. I have heard good sounding instruments that made use of laminated top where the grain orientation of the plys was the same, but not enough to come to any conclusions about this class of construction. Hope this helps; best of luck with your project." of the Guild of American Luthiers. See the G.A.L. website at http://luth.org. of science and technology of stringed musical instruments. See the Savart Journal website at http://SavartJournal.org. See the NEL website at http://newenglandluthiers.org. Masakichi Suzuki (1859-1944)was Japan's first violin producer. His father was a samurai moonlighter who also made shamisens in Nagoya. Masakichi succeeded his father's craft business that soon failed. In the push for westernization in Meiji, he naturally became interested in shamisen's western counterpart: violin. In the 1880s, he started to manually produce and sell violins. He founded the Suzuki Violin Factory in 1900. By 1910, his factory was producing 65,800 violins per year. Nagoya became the manufacturing center of string musical instruments. There was 'one' Suzuki company before the 2nd World War. After the war, a entity created by the US and allies called GHQ (for General Headquarters) dismantled some parts of 'Imperial' Japan and some companies were closed or restructured. 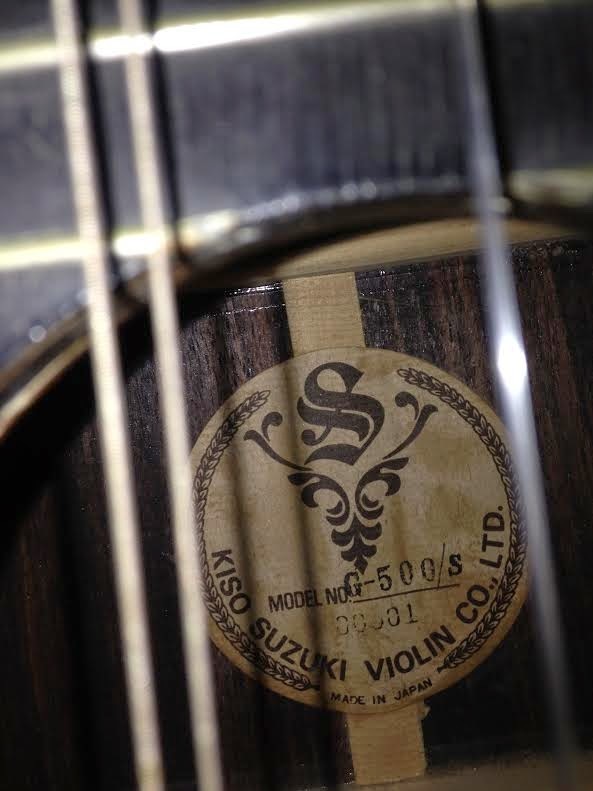 In Suzuki's case, the company was separated into - the Suzuki Violin Company, changing to the Kiso Suzuki Violin Company and the Suzuki Violin Manufacturing Company came to be called the Nagoya Suzuki Violin Company. Kiso Suzuki went bankrupt in 1987 and the machines and materials were sold to ESP. Nagoya Suzuki stopped making guitars in 1989. Many guitar players own more than one guitar, yet a common story it seems is that the Suzuki guitar is the one played most often, or that stays with them when all others are sold. Re: the serial number: on many of the models the first one or two numbers in the serial number stands for the year in which it was manufactured; from the 60’s to the 80’s. I have never seen a definite 1950's guitar yet, mainly because I don't know enough about them yet.The other prefixes/suffixes ...W, C, S, VS, D, G, A, T, R, O, J...may follow other common meanings. This is a blog dedicated to older Suzuki Guitars. Suzuki Guitars have been around since the early 1900's and have attracted a growing interest by players and collectors alike. The company may be known by the generic label "Suzuki", but there are actually three different Japanese companies that have manufactured guitars under the name of Suzuki to the present time - Kiso Suzuki, Nagoya Suzuki, M Suzuki (Manji Suzuki)/Suzuki (modern company) but Kiso and Nagoya have a common ancestry. Masakichi Suzuki started making violins in 1887 and became well-known in a short time - because of a combination of good timing and quality. He made guitars starting in the early 1900's, and early models are pretty rare. After the 2nd World War, his original company was split into two - Kiso Suzuki Violin Company, run by one of his sons, and the Nagoya Suzuli Violin Company, run by another son. Both companies made guitars, as well as other stringed instruments for awhile. Kiso-Suzuki manufactured guitars in the region of Kiso-Fukushima, Nagano prefecture. Nagoya Suzuki manufactured guitars in the region of Nagoya Japan. They manufactured about the same number of models as Kiso, and many of their model numbers are the same. But each had different brands and labels, but both are well-liked by owners of their guitars.